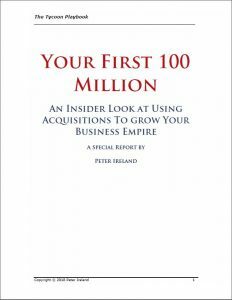 Your First 100 Million: Are You Up For It? Have you been thinking about using strategies that would enable faster growth? Then take this mini-version of The Tycoon Playbook course. It’s an insider overview of what’s involved with using the classic billionaire strategy, the biggest hurdles you will face, along with solid advice on how to succeed as a deal-maker. This is the perfect item for the entrepreneur or consultant curious about accelerating growth. Whenever the topic of small business growth strategies comes up, there’s one that’s almost never remembered. I refer to growth via acquisitions, or as it’s sometimes called “inorganic growth.” Practically everyone’s thinking is limited to so-called “organic growth.” So let’s take a look at these two basic growth strategies and consider their pluses and minuses.